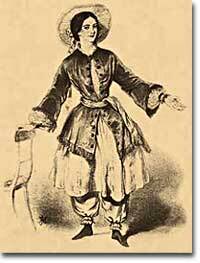 Amelia Bloomer's magazine, The Lily advocated a new outfit for women, consisting of a loose top, long pantaloons, and a knee-length dress. While some reformers adopted the costume, many were afraid that it would bring riducule to the cause and began wearing more traditional clothes by the 1850s. Although women had many moral obligations and duties in the home, church and community, they had few political and legal rights in the new republic. When Abigail Adams reminded her husband John during the Constitutional Convention to "Remember the Ladies!" her warning went unheeded. Women were pushed to the sidelines as dependents of men, without the power to bring suit, make contracts, own property, or vote. During the era of the "cult of domesticity," a woman was seen merely as a way of enhancing the social status of her husband. By the 1830s and 40s, however, the climate began to change when a number of bold, outspoken women championed diverse social reforms of prostitution, capital punishment, prisons, war, alcohol, and, most significantly, slavery. Activists began to question women's subservience to men and called for rallying around the abolitionist movement as a way of calling attention to all human rights. Two influential Southern sisters, Angelina and Sarah Grimke, called for women to "participate in the freeing and educating of slaves." Elizabeth Cady Stanton's daughter kept a scrapbook of her mother's activities with the women's rights movement, now housed at the Library of Congress. Harriet Wilson became the first African-American to publish a novel sounding the theme of racism. The heart and voice of the movement, nevertheless, was in New England. Lucretia Mott, an educated Bostonian, was one of the most powerful advocates of reform, who acted as a bridge between the feminist and the abolitionist movement and endured fierce criticism wherever she spoke. Sarah Margaret Fuller wrote Women in the Nineteenth Century, the first mature consideration of feminism and edited The Dial for the Transcendental Club. Around 1840 the abolitionist movement was split over the acceptance of female speakers and officers. 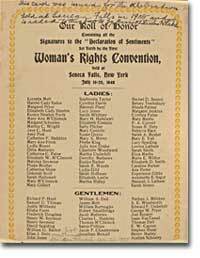 Ultimately snubbed as a delegate to a World Anti-Slavery Convention in London, Elizabeth Cady Stanton returned to America in 1848 and organized the first convention for women's rights in Seneca Falls, New York. Under the leadership of Stanton, Mott, and Susan B. Anthony, the convention demanded improved laws regarding child custody, divorce, and property rights. They argued that women deserved equal wages and career opportunities in law, medicine, education and the ministry. First and foremost among their demands was suffrage — the right to vote. The women's rights movement in America had begun in earnest. Amelia Bloomer began publishing The Lily, which also advocated "the emancipation of women from temperance, intemperance, injustice, prejudice, and bigotry." She also advocated the wearing of pantaloons for women that would allow for greater mobility than the expected Victorian costume — now these garments are called "bloomers." 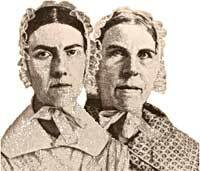 Sarah Grimke and her sister Angelina Grimke Weld came from a slaveholding family in South Carolina. Their involvement in the abolitionist movement eventually lead to their involvement in the struggle for women's rights. As with the Civil War, the seeds of the quest for women's rights were sown in the Declaration of Independence, claiming that "all men are created equal." Sarah Grimke wrote in 1837 that "men and women were created equal ... whatever is right for men to do is right for women." That language was mirrored in the Seneca Falls Declaration. Thus, in this era of reform and renewal women realized that if they were going to push for equality, they needed to ignore criticism and what was then considered acceptable social behavior. The new republic's experiment in government was going to need all of its citizens to have "every path laid open" to them. However, the ardent feminists discovered that many people felt women neither should nor could be equal to men. The nation soon became distracted by sectional tension and the climate for reform evaporated. This important struggle would continue for many generations to come. From the National Women's Hall of Fame this is a fascinating short biography of Amelia Bloomer. Bloomer founded The Lily, the first newspaper for women owned and operated by a woman. This early feminist is perhaps better known today for her support of women wearing a garment which now bears her name — bloomers. Elizabeth Cady Stanton was the women who was believed to be the driving force behind the 1848 Seneca Falls Convention. This biography from the National Park Service includes plenty of pictures and good hyperlinks to other early figures in the Women's Rights Movement. This novel, published in 1859, is recognized as the first published by an African American woman. The tale begins as a young girl is indentured to a cruel mistress by her destitute parents. This riveting book is here in full, so read on for a fictional, yet realistic account of a servant girl's life in the 1800s. This site from the University of Rochester is a great introduction to the Women's Movement. They have the text of "The Declaration of Sentiments," pieces on Susan B. Anthony and Elizabeth Cady Stanton, and a section on the Seneca Falls Convention. Use the timelines provided to put events straight in your mind, and use the bibliography as a starting point if there is a report due on the women's movement. Sarah Margaret Fuller wrote the first major feminist manifesto, "Woman of the Nineteenth Century," which is also an example of transcendentalist philosophy. In 1840, Fuller accepted the editorship of The Dial, a transcendentalist quarterly from Ralph Waldo Emerson. This page serves as an adequate introduction to this brilliant women although it is rather short. Elizabeth Palmer Peabody was the educator who opened the first English-language kindergarten in the U.S. Born on May 16, 1804, Peabody helped establish kindergarten as an accepted institution in U.S. education. This Library of Congress has lots of relevant hyperlinks. What they don't tell you here is that Peabody operated a bookstore, and was one of the first people to champion the writing of Nathaniel Hawthorne. The world has never yet seen a truly great and virtuous nation, because in the degradation of woman the very fountains of life are poisoned at their source. -Elizabeth Cady Stanton, Seneca Falls Convention. She may introduced women to the comfort of pants, but according to Elizabeth Cady Stanton, Amelia Bloomer was no great reformer. Discover the trials and tribulations of Susan B. Anthony and Elizabeth Cady Stanton's struggle for women's rights for yourself through an interactive PBS presentation.